Collinfield sits between Pembroke Court and Clifford Drive in Kendal. These two roads give a clue to the importance of the house, and its one time owner. The house was built in around 1600, and retains many of its original features. These include the thick walls, a courtyard, and the original gate. Its first known owner, according to records dated 1620, was Jeffrey Sedgwick. The house later came under the ownership of Anne Clifford, Countess of Pembroke and Montgomery. 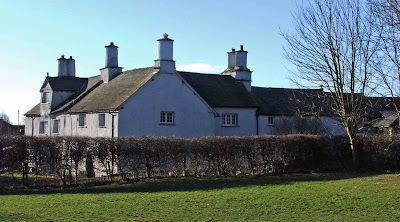 Anne is famously linked with the restoration of such buildings as Pendragon Castle in Mallerstang, Brougham Castle near Penrith, Skipton Castle, Appleby Castle and many other churches and castles throughout the North and North West. "NVNC MEA, MOX HVIVS SED POSTEA, NESCIO CVIVS." Which translates as "Now mine, presently his, Afterwards I know not whose." It's possible that the Countess brought this inscribed tablet from Brougham Castle, one of her favourite haunts. The house was remodelled by George Sedgwick, secretary to the countess of Pembroke, when he acquired it in 1668. On his death in 1685, the house became the residence of the Chambre family, and was subsequently purchased, in 1747, from George Sedwick's nephew by Mr John Yeates, in whose family the house remains to this day. The building exhibits later additions and features, but still retains is medieval character. It is often documented that this house can be classified as a 'fortified' dwelling...though, secure as it may have been, with its courtyard, it does not seem to display any fortifications per-se. In Kirkland, less than half a mile away, there is a building called Pembroke House, which, due to the name, Pembroke, is sometimes associated with Lady Anne Clifford. 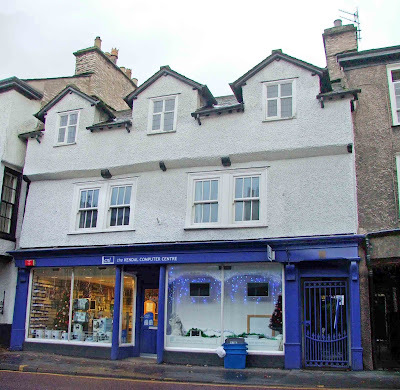 Built sometime in the latter part of the 17th century, the building is one of Kendal's last surviving cruck built houses....ie with complex timber roof beams. But afterwards I know not to whom it will belong.